In July, we brought you the story about how the Cincinnati office staff members supported their co-worker, Technical Sergeant Paul Humphries, United States Air Force and Terracon CAD Operator, while he was deployed to a location in the Arabian Peninsula of the Middle East. The group put together a care package for Paul and his team that was filled with plenty of “goodies” from home. 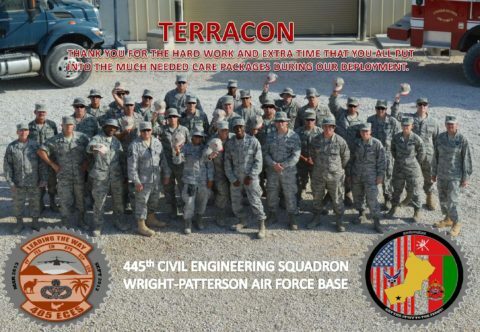 The care package contained favorite snack foods, other non-perishable food items that are not available in their location, as well as Terracon baseball caps for Paul’s team members! On Monday, November 11, Paul returned to his work at Terracon! He brought with him the photo on the left that features the Terracon baseball caps that the office provided along with a wonderful “thank you” from the troops.